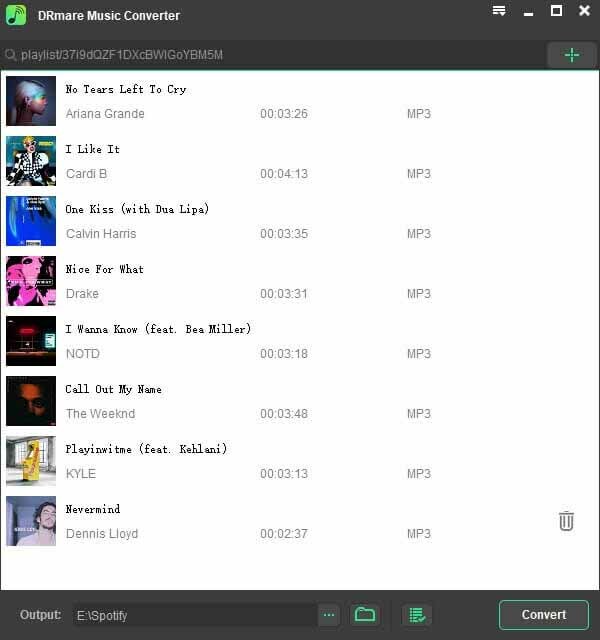 DRmare Spotify Music Converter is one of the best streaming music converting solutions for free and premium Spotify users, which can freely download and convert any Spotify songs, playlists and albums to MP3, FLAC, MAV, M4A, etc. for offline playing on all devices. Here's the detailed guide to convert music from Spotify to MP3 and other non-DRM formats with DRmare Spotify Converter. Double click the shortcut icon from the desktop to launch DRmare Spotify Music Converter for Windows which will load Spotify app automatically for you. And then go to Spotify store to find the songs, playlists or albums and drag them to the main conversion window of DRmare. Or you can copy and paste the URL of Spotify music tracks to the search box of DRmare's main interface. Note: You are not required to download Spotify songs or playlists on your computer in advance. 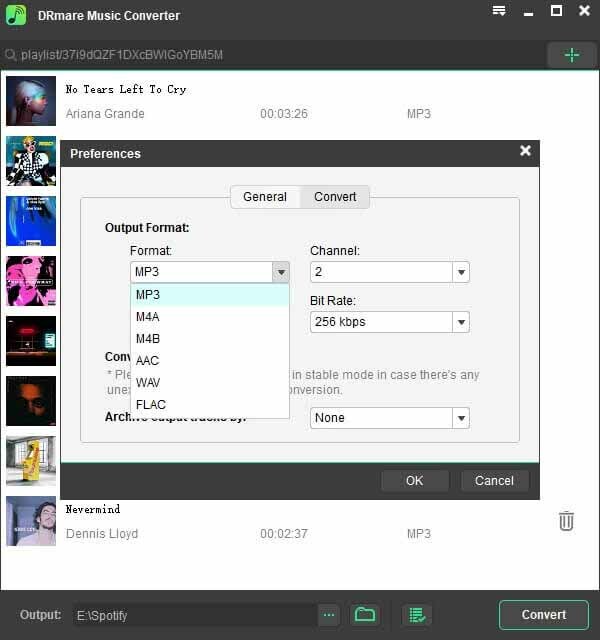 Simply add the tracks to DRmare and it will handle the downloading and converting task for you. After the Spotify tracks are loaded into DRmare, touch the menu bar and choose 'Preferences'. In the new window, you can set the output format as MP3 or others such as MAV, AAC, M4A, FLAC and M4B. Besides, you are allowed to customize output audio parameters like bit rate, frame rate, codec, channel, etc. In order to make the conversion more stable, we highly recommend you to define the conversion speed as 1X. Once all settings are ready, simply click the 'Convert' button and it will start to download and convert Spotify songs/playlists to MP3 or other common audio files. When the conversion process finishes, you can locate the DRM-free Spotify songs on destination folder and transfer them to any device, such as iPod, Zune, Sony Walkman, Creative Zen, etc. 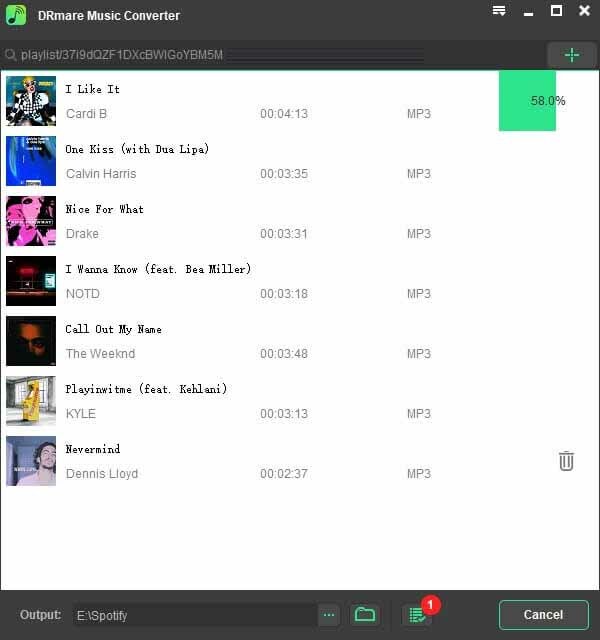 for offline playback at anytime you want.